Kenya Pipeline's continental dream in danger as they were stunned 3-2 by KCB during their National league playoffs match at Kasarani on Sunday.Pipeline must beat Prison at-least 3-1 on Monday to regain their title ambitions . The Kenya National Volleyball League playoffs enters day three on Monday with an epic battle between rivals Kenya Pipeline and Kenya Prisons expected to thrill at the Kasarani Indoor Arena. This is billed to be the battle of the afternoon as both teams must win the match to be guaranteed direct qualification to continental championships next season. It will be a heavy task especially for defending champions Kenya Pipeline who were stunned 3-2 by KCB (29-27,19-25,22-25,25-20,15-12) on Sunday afternoon in a thrilling clash that lasted three hours. Going into the final day with one triumph against Bungoma County , Pipeline must win with a good set ratio preferably 3-0 against their long time rivals Kenya Prisons who have already picked two straight wins against KCB and Bungoma County. Speaking from the sidelines at Kasarani on Sunday, Pipeline center player Trizah Atuka who is out of action on sick leave said , " It is what it is , we need to have this match behind us and focus on the next assignment. We need to face Prison with a winning mentality and attack every ball with a point in mind. Although this defeat against KCB has made our mathematics difficult , we have a good chance and I believe in my team mates." Pipeline head coach Japheth Munala on his part noted that, " It was very difficult to chase the match as this put a lot of pressure on the players and encouraged the opponents. We however must rise from the loss and take the next match with determination"
Also on Sunday , Kenya Prisons dispatched Bungoma County with straight sets of 25-11, 25-10 and 25-19 . In the men's action on Sunday, GSU recovered from an early take off by KDF to bag the match 3-1 with sets of 24-26, 25-20, 25-11 and 25-13. 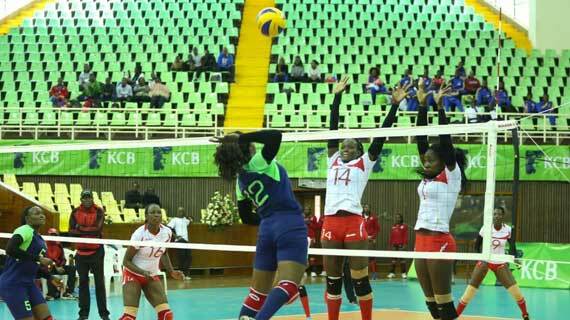 Kenya Prisons on the other hand upset KPA 3-1 in an entertaining clash winning 25-14, 30-28, 15-25 and 25-20.